Welcome to the world of walk / bike / run / skate / row. Riversdale is a neighbourhood that offers all the best of an urban lifestyle: Use the river valley as your playground, the farmers' market as your pantry, and the trails for your commute. The Village is tucked away in a quiet corner of Riversdale, but remains remarkably connected. 20th Street shops are an 8 minute walk away, Victoria Park and Meewasin Valley trails are steps outside your door, and Downtown Saskatoon is a beautiful river-adjacent 15 minute walk or 5 minute bike. Your whole lifestyle is accessible from your feet. 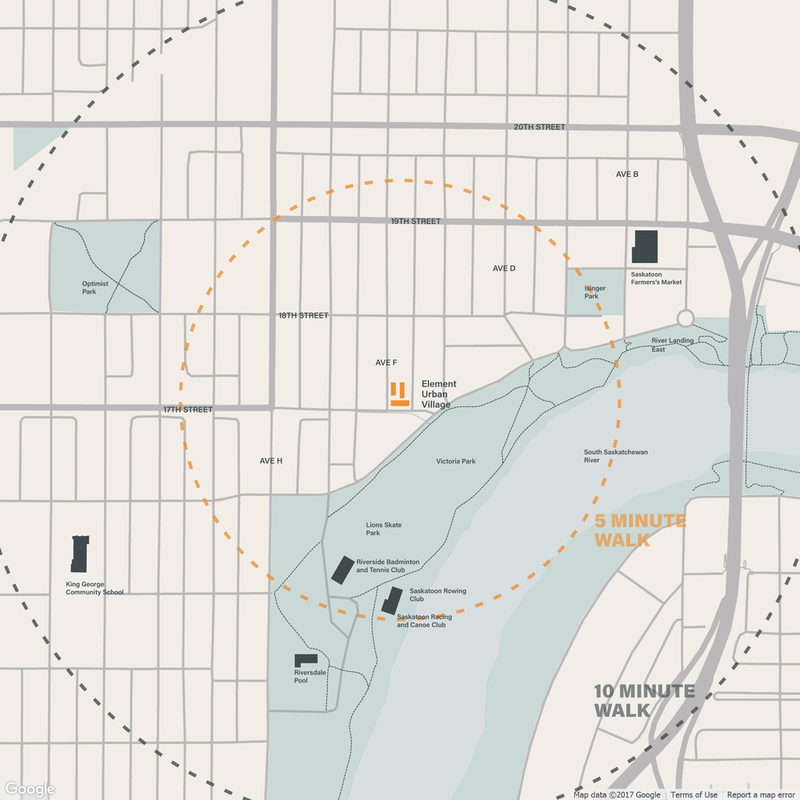 Saskatoon's best urban amenities are a pleasantly short walk from your front door. Fresh produce at the Farmers' Market, local shopping on 20th Street, and the best coffee in town round out your new Saturday routine. This is Riversdale at its finest. The spirit of community is fundamental to a great urban life. Element Urban Village is located in Riversdale, within walking distance of great restaurants, shops and a dynamic arts scene. With the expansive Victoria Park as your new front yard, the city’s best asset—the picturesque South Saskatchewan River—is all yours. Put this all together, and you're living right in the middle of Saskatoon's best kept secret: Riversdale. Your front yard is seven acres and the City cuts the grass. This is the neighbourhood you can call home. Run, bike, skate, and row your way through beautiful Victoria Park, less than a hundred steps from your front door. Whether you choose a bike, skateboard, paddleboard or your own two feet, Saskatoon's best kept secret is all yours. For both your commute and your workout, you're going to love your new front yard.